Science, Technology and Arts (=STARTS) form a nexus with an extraordinarily high potential for creative innovation. And such innovation is considered to be precisely what’s called for if we’re to master the social, ecological and economic challenges that Europe will be facing in the near future. The role of artists thus is no longer seen to be just about propagating scientific and technological knowledge and skills among the general public but much more as a kind of catalyst that can inspire and trigger innovative processes. The artistic practice of creative exploration and experimental appropriation of new technologies has a wide-reaching potential to contribute to the development of new products and new economic, social and business models. Accordingly, the STARTS Prize focuses on artistic works that influence or change the way we look at technology, and on innovative forms of collaboration between the ICT sector and the world of art and culture. Two prizes, each with € 20,000 prize money, are offered to honour innovative projects at the intersection of science, technology and the arts: one for artistic exploration, and thus projects with the potential to influence or change the way technology is deployed, developed or perceived, and one for innovative collaboration between industry/technology and art/culture in ways that open up new paths for innovation. Grand Prize – Artistic Exploration Awarded for artistic exploration and artworks where appropriation by the arts has a strong potential to influence or alter the use, deployment or perception of technology. Grand Prize – Innovative Collaboration Awarded for innovative collaboration between industry or technology and the arts that open new pathways for innovation. The submission phase for 2019 STARTS Prize begins on January 10th, 2019. The submission platform is accessible between January 10th and March 1st, 2019. The jury convenes on April 15th, 2019. 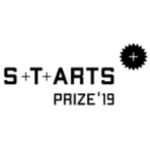 All STARTS Prize 2019 winners will be notified in May 2019 at the latest. The winning projects will be presented at the Ars Electronica Festival in September 2019 in Linz, Austria, at the BOZAR Electronic Arts Festival in September/October 2019 in Brussels, Belgium, at Waag in Amsterdam, Netherlands and at various partners worldwide.